Diamonds are precious for many reasons—they are rare, billions of years old, and one of the hardest materials on earth—but they are perhaps most revered for how they interact with light. Light is captivating, inspiring, and undoubtedly beautiful. Light slows down significantly when it passes through a diamond, and once inside, it bounces, bends, and refracts until it can find a way out. Depending on the way light moves within the diamond, it can disperse into every color of the rainbow. It’s no wonder why diamonds were once thought to be shards of fallen stars. 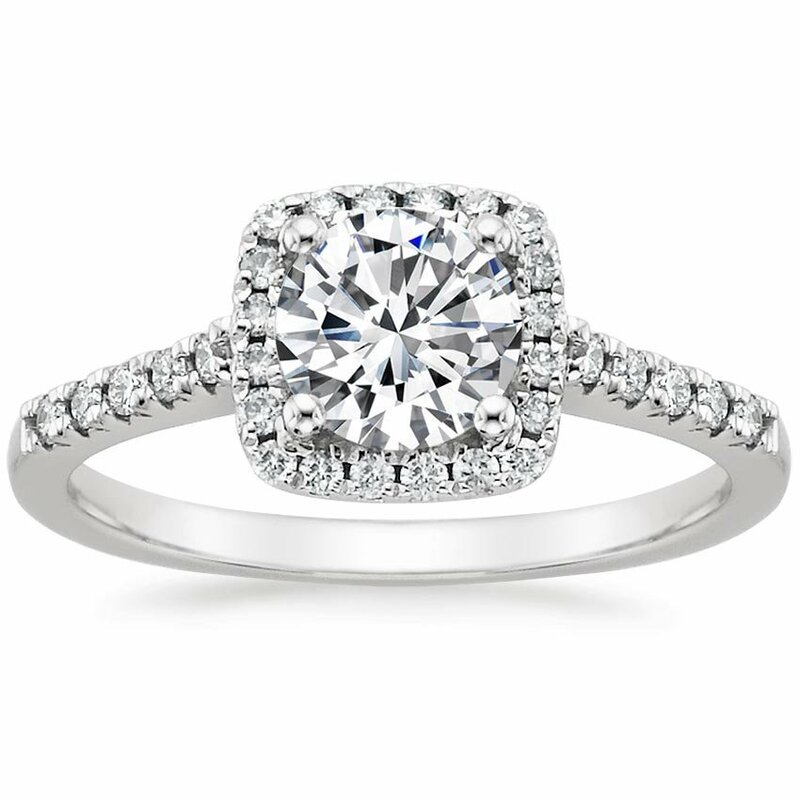 If you crave a ring that shimmers and dazzles from every angle, choose a pavé engagement ring. 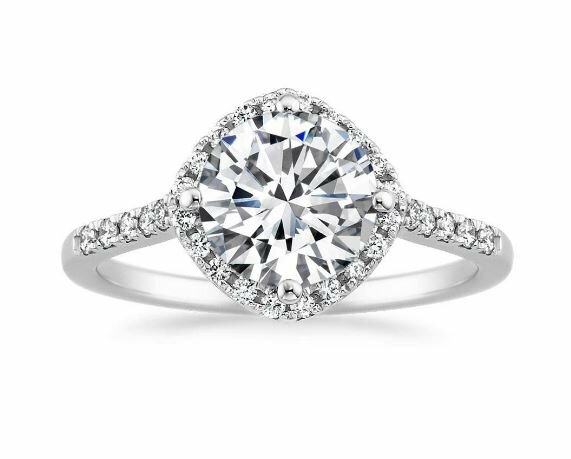 What Is a Pavé Engagement Ring? The pavé setting was created with maximum light and brilliance in mind. To create these stunning rings, accent diamonds are set closely together for a dazzling, diamond-encrusted look. 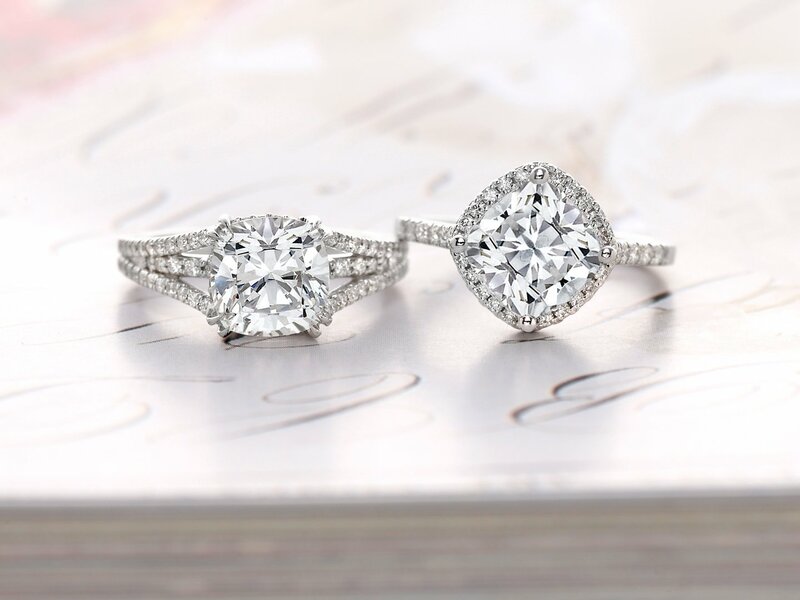 The word pavé comes from the French word for “paved,” so these engagement rings look as if their surfaces have been paved with diamonds, creating a glittering, unbroken expanse of light and sparkle. 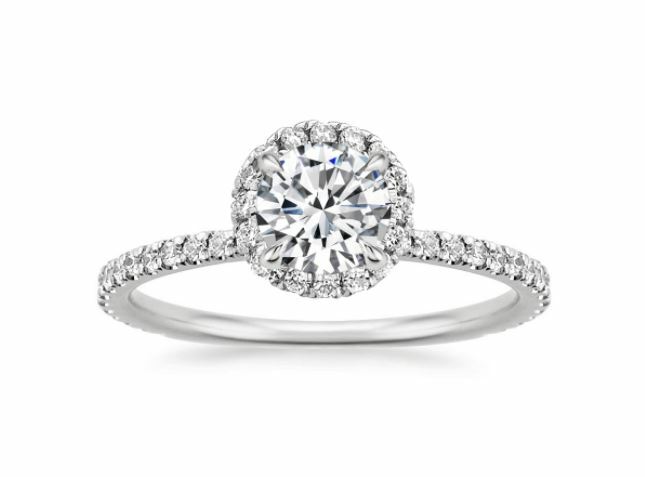 Halo engagement rings are becoming increasingly sought after for their brilliance and sparkle. Pavé halos feature a glittering halo of pavé set diamonds encircling a center gemstone, and are a popular option both with glamour-loving brides-to-be and for budget conscious couples, because a pavé halo makes a center diamond look much larger. The accent gems enhance the beauty of the main diamond, reflecting light back and forth in a rainbow of brilliance. 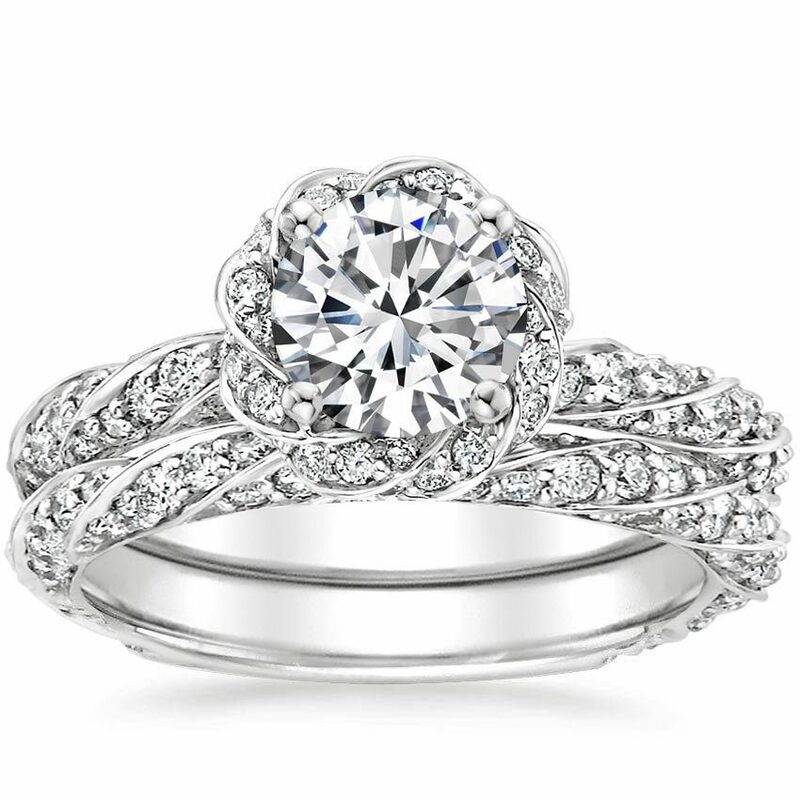 Halo designs become even more stunning when the band of the ring is also covered in pavé diamonds, whether the diamonds take the form of a single row, a split shank, or a subtly twisting vine design. If you love pavé engagement rings but would like your ring to have a very thin, delicate look, consider micro-pavé diamonds. This style features extremely small diamonds in a pavé setting, creating a whisper thin band of feminine shimmer. Micro-pavé diamonds can be set in the band or around the center gem, creating a highly detailed look. The diamonds may be small, but these rings are valued for their delicate beauty, and the masterful skill involved in their creation. Pavé settings have been used in fine jewelry since the 1700s, but were not widespread in engagement rings until the 20th century. You’ll often find Retro engagement rings featuring pavé diamonds, because big, bold designs with lots of shimmer ruled the day during that era. Celebrities are known for wearing engagement rings featuring eye-poppingly large center diamonds, and those dazzling gems are often accented by delicate pavé set diamonds to further accentuate the rings’ sparkle. Natalie Portman’s engagement ring features a pavé halo as well as pavé diamonds on the band (which is made of recycled platinum—we approve!). Reese Witherspoon’s 4 carat Ashoka diamond ring features pavé accents along the band, as do the engagement rings of famous brides Blake Lively and Katherine Heigl. 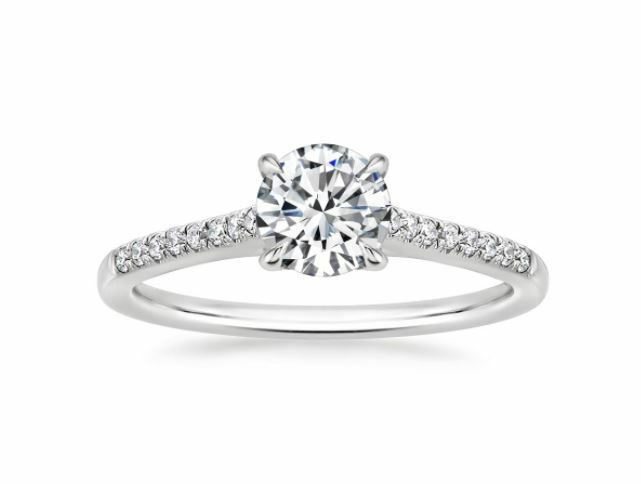 Why let your stunning pavé engagement ring be lonely? Pair your engagement ring with a gorgeous matching pavé wedding band to create a solid expanse of shining light encircling the finger. Or, mix it up and pair your pavé engagement ring with a bezel set wedding band or a prong set wedding band for a unique ring style ! Make sure you read up on women’s diamond wedding bands before you buy. 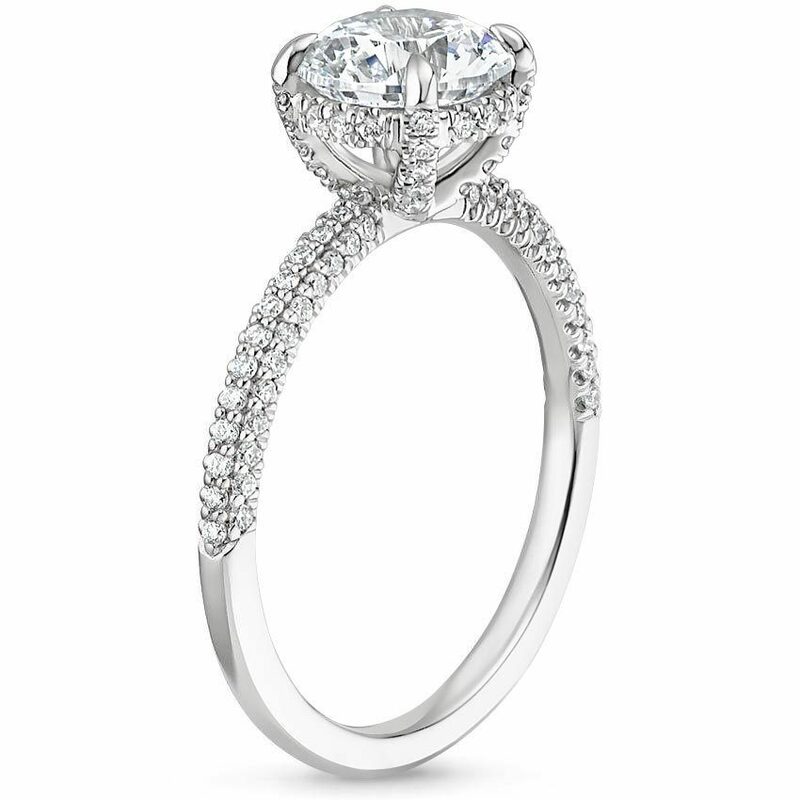 Do you adore pavé engagement rings? How many rows of pavé diamonds would your dream ring have? Let us know on Instagram, Facebook or Twitter, or in the comments below! Beautiful! Especially that first ring! Hi Kathy, we recommend appraising with an American Association of Appraisers certified appraiser, who is also a graduate gemologist. You can use your local yellow pages or Yelp to help find good recommendations. Thank you! I have a platinum engagement ring, very ornate, with a diamond in the center and pave diamonds encircling it. I also have a platinum wedding band with small diamonds circling the band. I would like to have it appraised and I live near Knoxville, TN. Can you help me find an ethical appraiser near my home?